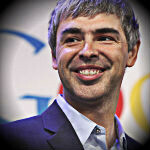 Google CEO Larry Page on Apple's "thermonuclear war": "How well is that working?" Larry Page took over as CEO of Google in April of 2011, although insiders say that the job was always his, Eric Schmidt was simply "keeping the seat warm" until Page was ready. On the technology side of things, there wasn't much doubt the Page had the skills, but when dealing with the media, Page was a bit reserved at first. But, he's growing more confident, and in a a new interview with Wired, Page is ready to take swings at Facebook. He even commented on Apple's "thermonuclear war" with a confident and clear "How well is that working?". The key to the interview was that Page really set out his world view. Page's number one concern is simple: always shoot for the moon, both with innovation and in business, because each should feed the other. Page mentioned inventors like Tesla who never saw the success they deserved because they didn't focus on making inventions businesses. Once that balance is struck, it's a matter of keeping up the rate of innovation. How exciting is it to come to work if the best you can do is trounce some other company that does roughly the same thing? That’s why most companies decay slowly over time... incremental improvement is guaranteed to be obsolete over time. His aim isn't to improve by 10%, but by a factor of 10, which brings a new meaning to Google X, and to not be scared to push into new products. He even took a shot at Apple on this front, saying, "Apple only does a very, very small number of things, and that’s working pretty well for them. But I find that unsatisfying." At the time we bought Android, it was pretty obvious that the existing mobile operating systems were terrible. You couldn’t write software for them. Compare that to what we have now. So I don’t think that betting on Android was that big a stretch. You just had to have the conviction to make a long-term investment and to believe that things could be a lot better. But, Page's push for Android to be better doesn't stop with software. He reiterated that Motorola is going to be run separately, but promised innovation from that company. The pace of that innovation did somewhat show that Page is disconnected from that division, because he referenced that in "the next 5 to 10 years" we will see a change away from smartphones that use easily broken glass. Motorola CEO Dennis Woodside should probably have told Larry that the flexible display change will be starting this year. you may have the greatest maps in the world, but if nobody uses them, it doesn’t matter. Our philosophy has always been to get our products out to as many people as possible. Of course, Page didn't comment on the company's support for Windows products, but we'll assume that omission would be because Windows Phone won't add much to the "as many people as possible" side of things. Larry Page has a very unique skill for a CEO: he doesn't let pleasing stockholders scare him away from pushing the company forward, and pushing at a hard rate. Where Page says that "incremental improvement is guaranteed to be obsolete over time", most CEOs see incremental improvement as the easiest way to hold their position as long as possible. Given that Page was always assumed to eventually be the CEO of Google, maybe he doesn't have to worry about losing that position. But for now, it is suiting him extremely well, and we're excited to see what Google brings in the years to come. The android operating system mirrors Google so well. Doesn't stay still or have one focus. Don't be surprised if in the near future Google has a chain of fast food restaurants. How is this a bad thing? Creativity leads to great ideas. Exactly right. Android does so much more than competing mobile OSes. Great for power users. Wow. Guys misunderstanding my post. I point is Google is so diversified and so willing to add fields to their portfolio that I wouldn't be surprised at some point Google adds fast food to their offerings Android as well just doesn't sit their and make the browser better, they are constantly adding features and tweaking the interface. Man I hope they can cross breed McDonalds fries & Chick-fil-a wedges. That would be awesome. Larry Page and Sergey Brin are way more talanted and important than Jobs for tech development. Page and Brin make Google a creative COMPANY where every1 can express him /herself and the result is clear. Job was the only creative man at Apple, and he managed by fear. Apple uses fear to compete as well: thermonuclear, lawsuits... and it works sometimes: HTC for example. But tyranny can never win, creativity will triumph always in technology. Creative, my foot, more like stealing and modify what already exists! Oh please. This would be like saying Apple copied the creator of the original cell phone by copying the actual Cell Phone part of it. The difference is that Jobs was not A BOARD-MEMBER of Palm, Blackberry or Windows like Eric Schmidt was at Apple. C'mon, be honest if you had a company and your "trusted" BOARD-MEMBER hi-jacked all the stuff that "your" company had been working on....are you telling me that would not be a problem for you?? What specifically did Schmidt hijack? There is nothing about Android 1.0, other than the dominance of the touchscreen, that was unique to iOS at the time. Are you talking about Jobs? It's partly true, but Jobs was creative in his own way: he could use available technologies to make compelling products like no1 else. He was like a good cook, with available materials he could make great meals. The bad side of Jobs is he tried to patent the materials and prevent other from using the materials to make meals themselves. Bull. No one should owe Apple for anything that existed before they released it. And much of what Apple are suing for has massive prior art and obviousness. When Apple made the claim in court that, "a tap is just a zero length swipe..., " it became clear to the world what their ethics really are. Yes, they are free of worry. They paid their protection money to the Mafia, and now something bad might not happen to their nice business. Jobs was a legend already even before the smartphones. Maybe the other guys had it easy then. Apple's impact can be felt only in US and few more affluent countries, and that influence is not always positive. Google reaches out to people all over the world and it changes everything by spreading the knowledge, makes it freely available to every1. Apple has more money, yes. But its stature is pale before Google. Larry Page is correct in saying, "Apple only does a very, very small number of things, and that’s working pretty well for them" but he neglected to add that, excrementally, Apple does more than any other company in the history of mankind and should be meritoriously acknowledged for it. I could smell the foul stench of your ignorance and fanboyism when I came aboard this post... Honestly, you can't possibly believe that last sentence you typed Cynipap. GE, DuPont, Kodak, Sony, and Xerox have done more for electronics than Apple can shake a retread iPhone at. "In the history of mankind"?? What are you, 12? Is your memory limited to your visit to the Genius Bar and the time you made a mixtape of Apple commercials for your road trip? LMFAO! You speak the truth. Learn to read, dear boy. Allow me to introduce you to R.I.F. : disneydad, meet R.I.F. So Apple has done more than anyone in the history of mankind? I'm sorry but, no. Let's take it back a step further. Franklin, Edison, Tesla, etc have done more than Apple. They did all the hard work without any technology to help them. Without their work there would be no Apple. I'm not saying Apple doesn't do anything, but they are not the greatest inventors in history. The GUI that Apple started with wasn't even their own invention, it was Xerox's. What Apple is great at is taking existing ideas and tech and putting it in a neat little package. But for you to call out Google for copying and sweep Apple's misdeeds under the rug is the epitome of irony. HAHAHAHAHAHAHA.....I read it as incrementally. LOL That completely changes the comment. I don't know if that's the proper usage of excrementally but now the comment makes more sense. +1....lol. This is one of the few times I had to look up words to know what they meant in the context of the post...LOL! !